We believe that structured sports can bring about holistic behavioural change to help youths-at-risk take control of their lives. Aside from improving their mental and physical wellbeing, the skills that they gain through sports become guiding principles for them both at home and at school. This empowers them to give back to society as active and responsible citizens capable of bringing about positive change in the world. Instead of focusing solely on competition, we use sports to build a sense of camaraderie and community amongst our constituents. Working in a team teaches them the importance of mutual respect and gratitude while instilling crucial life skills such as discipline and perseverance. These include placing a keen emphasis on the development of strong moral character to guide our youth to be exemplary leaders both to their peers and to the society at large. 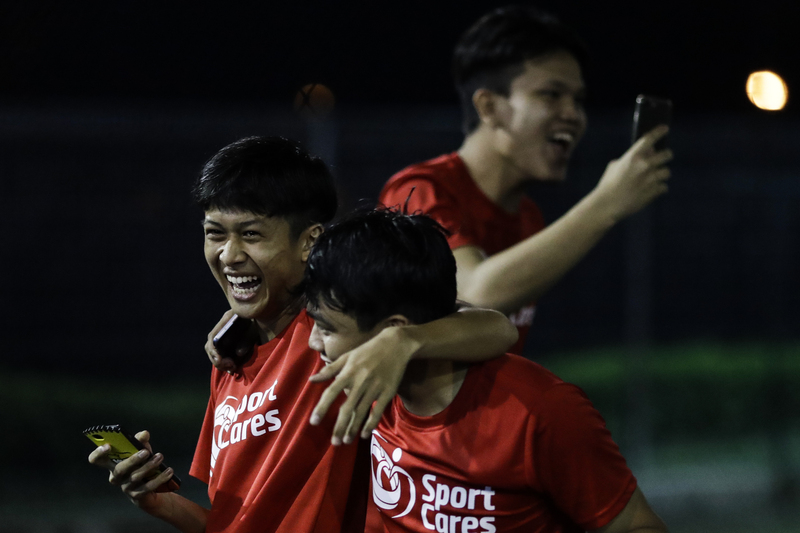 Our projects give vulnerable youths in Singapore a chance to play organised sports on a national scale under the tutelage and guidance of qualified coaches and trainers. Through these programmes, we are laying the groundwork for a more inclusive and integrated society where everyone is able to partake in sports, regardless of their background or financial means. Saturday Night Lights, or SNL, takes underprivileged and at-risk youths off the streets on a Saturday nights to give them formal football training and a healthy meal at the end of it — without charge. Five years since it started, SNL has grown from a football programme to a development programme, and many SNL youths have gone beyond participating in just football training to regular community volunteering and even leadership courses. Since its inception in 2016, the SportCares Swimming Programme has been making waves across Singapore by equipping vulnerable and at-risk youth with water confidence skills. Aside from helping them improve their basic swimming proficiency, the programme positively impacts their lives by providing them with a safe space to express themselves and develop leadership skills while being part of a sporting family. Under the mentorship of Singapore Swimming Association (SSA) approved swimming coaches, youths undergo a series of weekly training sessions that help to hone both their mental and physical abilities. In order to reach out to a wider network of youth, we are currently expanding our locations and increasing the number of sessions available at each location. For referrals to programmes, or opportunities to partner with us, drop us a mail at sportcares@sport.gov.sg.